To be a professional disruptor, you must be willing to take risks. This means you must be willing to fail. Billionaire James Dyson once said, "I've always thought that schoolchildren should be marked by the number of failures they've had. The child who tries strange things and experiences lots of failures to get there is probably more creative." 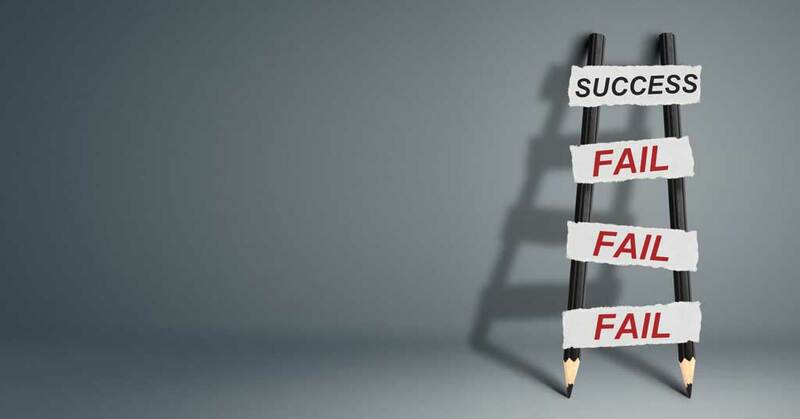 Here are more thoughts from well-known business leaders on the value of failure in their success, as well as two small examples of what we and some clients have tried in our own businesses. Chief failure officer. Jeff Bezos' net worth recently surpassed $100 billion. Not bad for a guy who says it is his job to fail often. In an interview with Henry Blodget, CEO of Business Insider, Bezos said, "I've made billions of dollars of failures at Amazon." Bezos stressed that for a company to have long-term sustainability, not just survive, it must experiment constantly and be willing to fail. "One of my jobs," said Bezos, "is to encourage people to be bold. It's incredibly hard. Experiments are, by their very nature, prone to failure. A few big successes compensate for dozens and dozens of things that didn't work." Rewarding failures = a culture of innovation. Business guru Tom Peters says, "I'd rather reward spectacular failures than reward mediocre accomplishments." What are you doing to encourage your people--and yourself--to see what is possible? You have to create a risk-taking culture, and you do that by constantly experimenting. No one did this more effectively than Steve Jobs building Apple. Great leaders encourage experimentation and risk-taking. Because of this, their people don't fear failure. "The only way to come up with something new, something world-changing, is to think outside of the constraints everyone else has," said Jobs. "You have to think outside of the artificial limits everyone else has already set." "Uberproof" your business. Every industry has an Uber coming. In a recent article, "How To Avoid Disruption," serial entrepreneur James Caan explains how you can take steps to prepare for the inevitable. "Invest in a team whose primary focus is innovation. This team should be full of people with a startup mentality, who will question your processes and make you think differently." Experience 2022 meetings. Epiphanies rarely occur in familiar surroundings. The key to thinking differently is to perceive things differently. To achieve this, you must force your brain to make connections it otherwise would have missed. It might sound difficult, but there are simple ways to get the creative juices flowing. Every Friday afternoon, for example, set aside two hours for "Xperience 2022" meetings. Calling it Xperience 2022 allows your employees to not focus on the how and instead focus on the why, what if, and why not? Encourage "crazy" ideas focusing on what your customer experience can look like by the year 2022--your product, services, and ease of doing business. Mitigate risk. You don't have to wait until 2022 to roll out these ideas. You can easily take the best ideas that come from your Xperience 2022 brainstorming sessions and roll them out in safe beta test environments, in just one department, location, or with one customer-facing employee for a month, for example. Limiting your new concept to a department, location, or employee allows you to test it in a controlled environment, track the results, make necessary changes, and have proof of its success. This will help you sell it to the rest of the organization when it is ready to be launched company-wide. No front desk. At John Robert's Spa we have always wanted to remove the traditional front desk and create more of an Apple Store-like environment. However, no one liked this idea at our existing salons so we waited until we opened a new location in 2013 to roll it out. There is no front desk, computer, printer, or receptionist sitting in a chair--not even a hostess stand. This concept was so successful from a customer service standpoint that the new salon immediately became the #1 selling location for product sales. In 2016 we opened another location, did the same thing, and had the same results. Now all our other locations want us to remove their front desks. Call center agent. We have clients who tested an idea by having only one call center agent greet callers by saying, "Thank you for calling ABC, this is Martha, who do I have the pleasure of speaking to?" They measured the results over 30 days and found that both her satisfaction scores and close rates were higher. The results gave them the ammunition to get buy-in from everyone else in the call center to say the same thing.